On the surface, Switzerland may seem all smooth chocolate, tasty cheeses and glorious mountaintops but beneath all that, there are plenty of odd and unusual sights to see that are off the beaten track. Definitely not on the tourist trail is a museum dedicated to H.R Giger, the brain who gave us the dual-mouthed aliens in the Alien series. Found in the medieval cheese-making town of Gruyères, the museum is a fantastic, if not rather weird, trip through the brain of Giger. The Heureka was built by Jean Tinguely, a Swiss sculptor with a sense of humour. His model, which to the untrained eye looks like a well-functioning machine, is actually completely useless. In 1782, Anna Göldi was beheaded for witchcraft, the last person to be executed for the crime in Europe. A few years before, she was fired from her job as a maid for the physician Johann Jakob Tschudi, after he accused her of witchcraft when he found needles in his daughter’s food. After undergoing two rounds of intense torture, confessing and then withdrawing the confession, Göldi was sentenced to death. The museum is dedicated to Göldi’s life and death. Literally the raw art museum, the Collection de l’Art Brut contains some mind warping works that you are not likely to forget any time soon. That’s because its artwork is the creation of those on the ‘fringes of society’, or more specifically, inmates from psychiatric hospitals and criminally insane prisoners. What you’ll find are around 60,000 pieces of art that defy standard artistic practice and push the boundaries of the imagination to the extreme. Both fascinating and disturbing, this museum is sure to leave a lasting impression. The Napeolonic wars gave us many things, like tinned food for instance, but it also gave us Estavayer-le-Lac’s Frog Museum. It’s all thanks to François Perrier, whose favourite hobby was capturing frogs in the country side, gutting them, stuffing the remains and posing them in everyday 19th century situations. At the frog museum, you’ll find 108 frogs playing cards, drinking beers and getting a nice trim at the hairdressers. It’s certainly odd, and strangely enough there are exhibits displaying Swiss military wear on show as well, mercifully without frogs. Tucked away in Geneva’s Cimetière des Rois is the gravestone of Jorge Luis Borges, arguably Latin America’s greatest author and one of the founding fathers of magical-realism. Borges began and ended his life in Geneva, and it was where he was exposed to tales in Old Norse and Old English, which would become the inspiration for many of his writings. The gravestone, like the man himself, is a bit of an enigma, with quotes from Borges’ own work and depictions of Viking and Norse lore shown on it. Fans from Argentina and beyond often make a pilgrimage to the site. The ‘House of Everywhere’ is a journey through the future. Within its walls, you can trace human beings’ fascination with the future and science fiction in pieces dating back to the 16th century. If you want to get a good dose of what other people’s futures looked like through history, head along and check it out. The museum keeps an agenda of its upcoming exhibitions which change on a regular basis. It may sound incredibly appetising, but if you try to sink your teeth into these ‘toblerones’, you’ll probably break them. 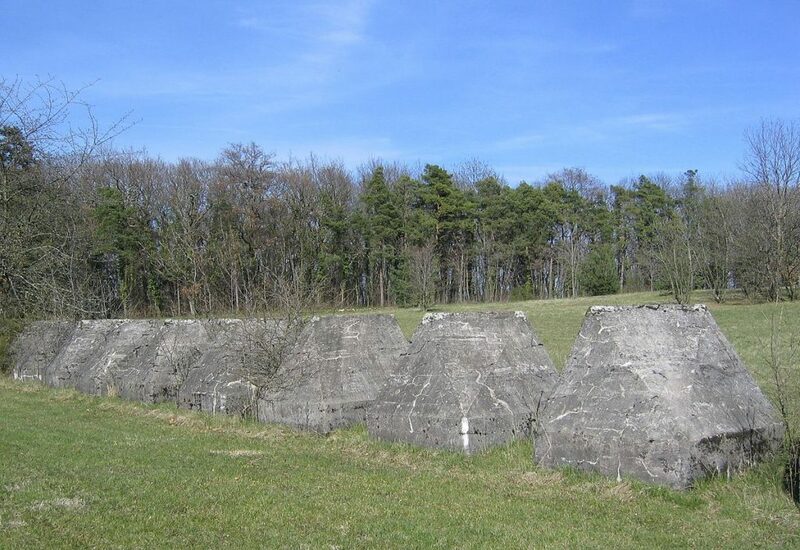 Built during the second world war to protect Switzerland from any potential German advance, they aren’t crunchy chocolate bars, but massive concrete ‘dragon’s teeth’. These anti-tank blocks run along 15km from the Jura mountains to the shores of Lake Geneva and are officially called the Promenthouse Line. Some 3,000 ‘toblerones’ make up the trail, each weighing in at around 16 tonnes. There’s been talk of removing them, but not if the Toblerone Trail Association can help it. That’s right, there’s even an association to protect them. You can pick up the trail near the train station at Gland, a short 10 minute trip from Geneva. While journeying along the Toblerone Trail, a two-storey, pink house will crop up. It would be easy to walk on by, but this isn’t a case of decorators gone wild. The Villa Rose is actually a carefully disguised fortification, housing three massive cannons. It was built in the 1940s when the prospect of invasion was a real possibility. A short distance from the Villa Rose is the Villa Vert, another fake country house that’s green, just a little easier on the eye. The Villa Rose is now open to visit as a museum. The Henkermuseum, or Hangman’s Museum, in Sissach should probably not be included in a family trip. Its collection spans three floors and pays tribute to all the chilling ways in which human beings have tortured and executed one another over the years. One Swiss item on display is a genuine medieval beheading axe.